A printer is an expensive appliance. Specifically, if you have got a laser printer, then the cost involved is higher than that of an inkjet printer. A laser printer, its cartridges, and its maintenance and service - everything is super pricey. Even a single act of negligence may lead to increased cost of printing in addition to unexpected work delays. Buy refurbished device and accessories Carefully. The rise of the environment protection movement has propelled the sale of refurbished items. Due to the low price factor, people are choosing refurbished printer and accessories more than ever. Recycled products can be good only if they have been re-processed by renowned brands or brand-authorized manufacturing plants. If a third-party manufacturer has been involved in the recycling processes, there is no way you will get original-like quality from your appliance. Similarly, if you are buying a recycled cartridge, do check if it is compatible to work with your printer. Otherwise, it might damage your printer permanently. Here also, I will say, you should buy replacement cartridges from the brand store or brand-authorized vendors only. Do not use ammonia-based cleaners for cleaning and shining up your printer. Better you should use isopropyl or ethyl alcohol to clean your printer. Just dampen a cloth with any of these solutions and gently rub the outer surface of your printer. 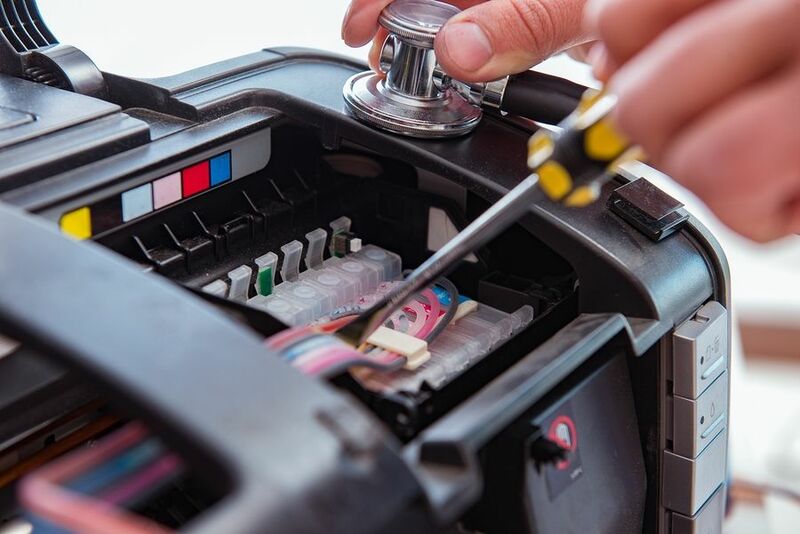 There is no need to wipe or clean the inner parts of your printer. However, if you see dust particles on the roller or any other part of the paper path, then clean it with a dry cotton cloth. Home printers have low printing requirements. That's the reason why most home printers give out dull prints. Your printer's toner or ink loses its pigment (A pigment is a material that changes the color of reflected or transmitted light as the result of wavelength-selective absorption. This physical process differs from fluorescence, phosphorescence, and other forms of luminescence, in which a material emits light.) if it is not used frequently. To maintain the color, you should take a few prints every week. Place your printer in a dust free environment. Do not place your device at a location which is exposed to dust, direct sunlight, and moisture. These are the three biggest enemies of your printer. When not in use, cover your printer with a large plastic sheet. If you are using your printer after a long time, then it would be wise to take out the papers first, tap them on the table top one or two times, and re-insert the bundle into the paper tray. If there is dust on the paper, it might get clogged while printing. Hire the best service available, not the cheapest available. When it comes to the health and performance of your device, you should hire a trusted on-site laser printer service in your city. Doing so will allow you to prevent your printer from going into unskilled hands. If you are asking for printer repair service from an individual just because he lives nearby, it could cancel your printer's warranty document. There you have it. These are some of the preventive tips that will improve the performance and prolong the span of your printer. If you have a cool tips that could help prevent a laser printer from damages and downtime's, do share it in the comments section.